Welcome to this week’s Sunday Survival Buzz – a roundup of preparedness news, tips, articles and recommendations from around the web. But first, an update on my own preps. We had the usual chaos around Casa DeHaro this week as we stepped over piles of preps and projects that keep stacking up with no place to go. Storage is at a prime which is what happens when you have a small home and too much stuff. On the other hand, 1,500 square feet means there is less to clean, less to heat, and less property taxes to pay. This photo was taken in a dark bathroom at night and with the door closed. If you read the review of the Aquapod, you will know that I have a tub full of emergency water that I absolutely will not waste since water costs about a dollar a flush around here. I am using a bucket of water from the tub to flush my toilet and also to fill watering cans for the garden. It is going to be awhile. Which brings me to the next prep: more snap peas went into the ground and I gave one more shot at starting a few seeds indoors. I moved my heat mat and grow light set-up out of my office to the garage and amazingly enough, the lettuce and basil seeds germinated very quickly. Perhaps there is still hope for my summer garden. This week my Amazon haul consisted of two things: one of the Tac Force folding knives that has been on the top 10 most wanted list and also a portable Coleman Lantern. Shelly has promised me a side by side comparison of the Tac Force with his Kershaw OSO Sweet and some of our other pocket knives. All I will say about it right now is that for $10, it is a great folding knife that has the added advantage of being easy for me to open and close without pinching or cutting myself. But the coup de grace this week (I hope the is the right word) is the Coleman Mini Lantern. You already know that I have a flashlight fetish but this is a slightly different take on portable lighting. It is 7.5 inches tall and weighs just seven ounces, including batteries. And boy does it give off light. Okay, like I said. I have a thing about lighting. Okay, enough about me and my stuff. Let’s get on to the Sunday Survival Buzz. 4 AND THE WINNER IS . 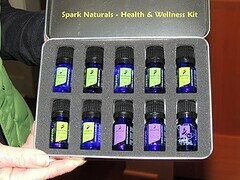 . .
9 Are You Interested in Essential Oils? Let me start this week by calling your attention to a series in progress by Keep It Simple Survival. Ed and his family have embarked upon a two-week, Off Grid Experiment. On April 19th, we are going to shut off our water and power and see what it will be like to live without public water and power for two weeks. During that two weeks, I will try to blog every day to let you know what went well and what little surprises popped up that we didn’t expect. I think we are pretty prepared but this little experiment will show us where we have preparedness weaknesses. You can click on the link and then, using the navigation on the top, left of the screen, work your way through the first week. I am enjoying the series and think you will, too. And finally, from the this is insane department: Taxing Solar Energy. As a matter of fact, my pal George Ure told me the local PTB are trying to charge him for using his own solar energy. I remember percolators! I remember some really good coffee – and some really bad brews. Timing is everything. But you can use most drip coffee makers without electricity. It depends on the design. Some, like Mr. Coffee brands, open from the top. When the lid is up, the basket is exposed. Prepare the coffee maker as you usually do. Boil water in a pan over whatever cooking device you are using. Slowly pour the boiling water into the basket. It will drip through the grounds and into the carafe just like it was designed to do. The coffee maker only needed electricity to HEAT the water. Here are this week’s giveaways. There is still plenty of time to jump on over and enter. We definitely do not recommend re-using the product. The bag was designed for temporary water storage and even if you use bleach, you run the risk of not getting all the bleach out and possibly ingesting it, as well as mold and other bacteria’s could form, making you very ill.
Knowing this, we purposely designed the bag to be recyclable. In addition, that’s why we came up with deluxe kit with 3 liners, and remember you can always by replacement liners from our website at any time for $10. Question: How will you hold on to your humanity following an apocalyptic even such as a pandemic? Answer: If I make it through the first 2 years, I will try to rebuild through good will and practicing the art of being a good friend. At this time I have no group and hope to find one before The End Comes. Truth be told, I was surprised at how few entries there were this time around. The Brushfire Plague series ranks up there with my favorites. Maybe you did not like the article or was it the question? Anyway, congratulations, Barbara. Who would have thought it? Yes you can freeze dry your own foods! Our newest sponsor is HarvestRight. Check it out. This would be a great item for a group of like-minded friends to purchase together and share. I also want to let you know that I have worked with Marjory Wildcraft to obtain a special discount for you on the GROW YOUR OWN GROCERIES DVDs. I paid $69 for this DVD set a few years ago. Right now, it is being offered at $27.75 to Backdoor Survival readers. There is tons of useful information in this series – not only about gardening but about rabbits, chickens, water conservation and more. I will be sharing an updated version of my review soon. Have you noticed how many preparedness websites are beginning to share information about essential oils? I think that is wonderful because if things really go to poo, then we are going to have to rely on something other than pharmaceuticals to stay healthy. Lately I have wanted to write about essential oils every day of the week but of course I can’t do that. I do, however, plan to keep you updated as I learn new things. One thing I will mention is that we have established a ritual if “salving up” every night. More about that next week. In the meantime, Spark Naturals has created a Digestive Blend using a proprietary combination of the best essential oils for the many aspects of digestion issues. Digest can assist you in preventing, restoring and maintaining a normal balance with your digestive system. The proprietary blend of Lemon, Spearmint, Myrrh, Fennel and Ginger is a powerful combination with specific attributes to cover a wide range of troubles. Be sure to use the code “BACKDOORSURVIVAL” to receive a 10% discount on your order! It has been awhile since I have reported a blooper. This week I have one for you. We tried to upgrade one of my older Maglite flashlights to an LED. We used a kit (this one) but to make it work we risked destroying a perfectly good Maglite so we gave up. This was not my type of deal. I know I mentioned this upgrade kit in the past; if you decide you want to try it, use at your own risk. Sometimes I wonder if website surprises are something I do so that I do not get bored with the same old thing or whether I do it to see if you are paying attention. I know, we have been down that road before. But truly, I have a surprise coming up later this week that I think you will like plus another incredible Friday giveaway. All that being said (and sorry, but this is the truth) I am trying to scale back a bit so I can take weekends off. I am hitting the road and heading to Alaska for a couple of weeks next month so maybe I can figure it out while surrounded by all of that serene beauty! Anyway, what about you – what did you do to prep this week? Until, next time, remember to make every day a prep day! Spotlight Item: My number one pick for Mother’s Day gifting is the Spark Naturals Health and Wellness Kit which includes all of my favorites. Be sure to use the discount “BACKDOORSURVIVAL” to enjoy a 10% discount on entire order. Bargain Bin: For your discernment, here are of some items mentioned today as well as some personal and BDS reader favorites. Tac Force TF-705BK Tactical Assisted Opening Folding Knife 4.5-Inch Closed : What I really like about this knife is that is is very easy to open and close. That said, it is very sharp. If you shop for this knife, be aware that some colors are less expensive than others. I purchased the black one but I thought long and hard about the pink. Kershaw OSO Sweet Knife: You can’t beat a Kershaw knife for quality at a reasonable price point. Typically under $23 – but $20 as of this writing – this knife will become your favorite for every day carry. And that includes the ladies, too. Hydrofarm 2-Foot Jump Start T5 Grow Light System : I love my new grow light. It is sturdy, well built and the light itself is adjustable. There is also a 4 foot version. Hydrofarm MT10006 9-by-19-1/2-Inch Seedling Heat Mat : I have always used a heat mat with my seeds but in recent years I have been purchasing starts. My old mat is long gone and this year I am growing my own veggies from heirloom seeds. This is the heat mat I am using. Yimby Tumbling Composter : I love my new composter. This one was $99 and it works great – unlike the first one I purchased and returned. If you have hesitated to begin composting, consider this tumbling version. I will keep you posted about my progress but so far I am pleased. Shop the Emergency Essentials Monthly Specials: The monthly specials at Emergency Essentials feature discounts of up to 35% off sometimes a bit more. This month is no exception with a couple of my favorites on sale. This month the Freeze Dried Tomatoes are on sale for 50% off. How do they do that? I called and asked – inquiring minds and all. Emergency Essentials purchases in huge quantities so when one of their suppliers comes up with a deal, they purchase 100% of the stock and pass on the savings to us. Another food item to consider this month MH Gourmet Entrée’s Combo which is on sale for $129.99 which is 36% off. off the regular price. Note: I have purchased and used these tomatoes. Yes, they are a golden, orange color but they are absolutely the sweetest FD tomatoes I have tried so far. Help support Backdoor Survival. Purchases earn a small commission and I thank you. Something that I didn’t consider to be prepping related, but then realized that, in some ways, it is related. I went to the local public library looking for a book. I found that they have a bookcase with books for sale. I’m not sure about your library, but here they were charging 10 cents for paperback books and 25 cents for hardbacked books. A really great and inexpensive way to stock up on books to give some relaxation and entertainment in a grid down situation. I bought two hard backed books and one paperbacked one. Total cost was 60 cents ( I gave them a dollar and told them to keep the change). Oh – you don’t need to have a library card to buy the books. Now I’m invious of you! Now I’ll have to dig up the cash to purchase that book. Kimberly – if the person wants to still use the grid and have the solar/wind kick in when the grid fails, that can be done (safely!) without using a grid tie setup. Which costs more anyway. Just be sure to use a qualified electrician when setting it up. . Question is, how long before they begin taxing off grid usage?! I love my Mini Coleman Lanterns! The sliding back panel means they can fill a tent with light, or close it, clip it to your belt and it’s a path light. LED means it will last a long time (if it’s not abused) and using rechargeable batteries makes it very cost effective! I try to buy one once a month. Please forgive me Gaye, I do not enter the novel giveaways. I know my anxiety level and they would send me over my limit. But I just love my pocket mushroom book. I bought medical supplies from Emergency Essentials, Put together my new HERC oven and transplanted tomatoes into grow bags and larger pots. I also didn’t get this posting in my email, came on line to read it. Marilee – go ahead and enter them! If you win one and don’t think you will read it, then pass it to a family member or a friend. Or even consider donating it to the library or local school. However, quite often one of those type books make a great gift! Yes you are right, my children know me though, before I give a book as a gift I must read it! I wonder if I could resist the temptation? Alaska? Great place to be still and breath.